It continued to be cold last week requiring us to don several layers of clothing before setting off to the allotment. 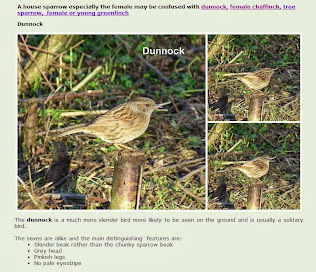 It was the type of cold that is deceptive, the sun often shone but the biting wind kept the temperatures low. (Unfortunately it wasn't only the wind that was biting, as I ended the week with two itchy bites courtesy of some creature that had no business being out in such conditions). 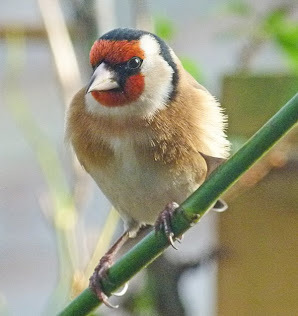 Clear skies on a night meant that Jack Frost made us glad that we had not succumbed to a frenzy of seed sowing earlier when the conditions were very different. One plant that fell victim to Jack's icy fingers was a kiwi berry - Issai - that we planted the previous week. All the leaves have been crisped and the plant looks very sorry for itself. As it was previously living in a pot in the garden chances are that it would have suffered even had we not relocated it and we are hoping it will recover when the weather improves - I keep telling myself it will improve. The effect that the frost has had on our fruit trees and bushes will only become evident when the flowers drop and immature fruits have formed or not! 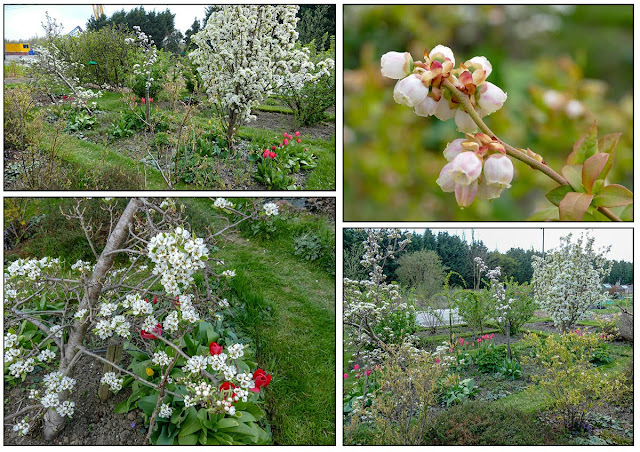 The pear trees are in full blossom as is the earliest of our blueberry bushes. I was happy to see and hear that the cold weather hadn't deterred the bees from visiting which seems to imply that all is not lost. Surely the bees would sense that pollen had been killed. We have continued preparing beds for planting. 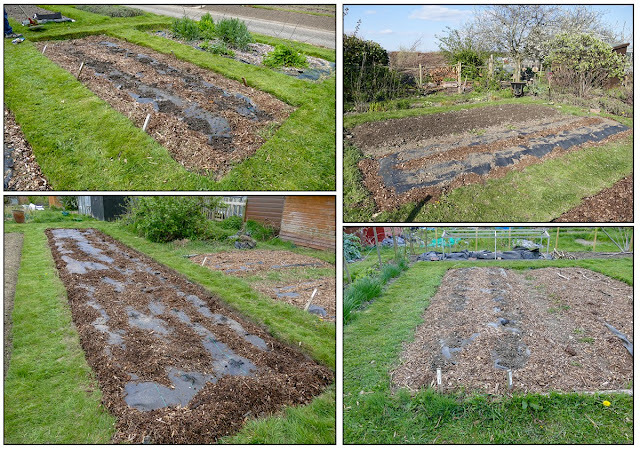 Martyn has tilled the already hand dug soil as a slight crust was forming due to a lack of rain and the drying winds. Once tilled, the beds were covered with weed control fabric in readiness for planting. Surprisingly the wind hasn't yet flattened the cardoons. Martyn strimmed all the grass paths, taking care not to strim flowers that had decided to escape the borders and naturalise in the grass. One bed was prepared for our new strawberry plants, but we decided not to plant them out this week and hope that the weather improves. We had also intended planting out the new raspberry canes but this too has been put on hold. The last of the red cabbages have now been dug up, as have the Brussels sprouts plants which were amongst last years failures. We left them in the vain hope that the sprouts would swell but this was not to be. There are still some cabbages and Purple Sprouting Broccoli living in the bed shown below and so this couldn't be cleared completely. 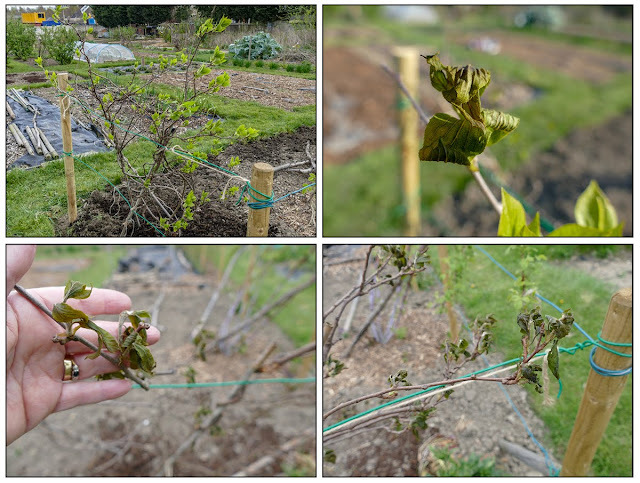 Buds were starting to develop on the grapevine growing against the shed and so I pruned it back a little harder to keep it in check. We did do some planting. We planted more of our potatoes as they won't pop their noses up to be greeted by a kiss from Mr Frost just yet. They are safely tucked up underground. We had planned on finishing all the potato planting at the weekend but in the end we wimped out. (There are limits Margaret). So far we have planted some of the Casablanca and Athlete tubers. We have planted just four tubers each of our six trial varieties, Jazzy, Elfe, British Queen, Premiere, Apache and Rudolf. We have also planted rows of Vivaldi, Nadine, Osprey and Winston. We still have Sarpo Mira, Cara, Kestrel and the leftovers from the varieties already planted to complete planting. We had been concerned that the tops of the potatoes planted in the greenhouse would have been knocked back but, at least on Friday when we last visited the plot they were still going strong. They have been covered with enviromesh as some added protection. As they are hardy, we planted up our shallot sets, Longor, Golden Goumet, Red Sun and Meloine along with more onions sets - Rumba, Red Karmen, Sturon, Centurion and Hercules. The onion sets planted on 24 March are starting to shoot and will soon take off if the weather bucks up. 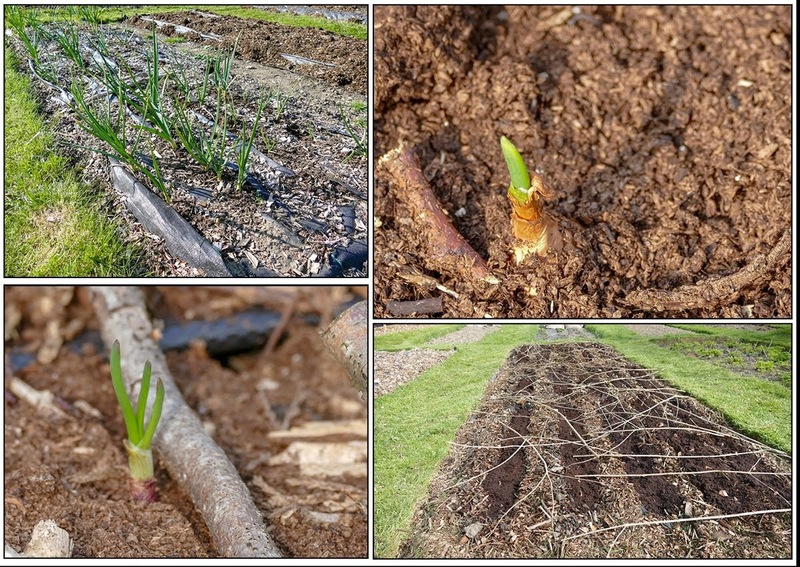 The autumn planted onions, in the photo top left, are now kicking off their winter lethargy and growing well as is the garlic in the same bed which will be happy to experience a cold spell in order to help with clove formation. I thought when I planted the garlic in a tub in the garden in February, that I may have been too late to catch a keen frost as it turned unseasonably mild. I needn't have worried. Again we have managed a modest harvest. The Aalsmeer cauliflowers that have been overwintering are now producing curds. After quite a few unsuccessful seasons as far as PSB is concerned, this year we have been quite pleased with our harvest. As I mentioned previously we dug up the remaining red cabbages and prepared the bed for its next occupants. These cabbages are only small but the leaves are so densely packed that they actually produce far more than you would expect. I've posted a video of some of last week's gardening activities here. So did you manage to brave the weather and get some gardening done last week or was the weather kinder in your part of the world? By the way, thanks to those who responded to my invitation to make a comment. I appreciate you taking the trouble to say hello. I know I get lots of visitors who never comment and I'd love to know who you are - unlike the annoying spammers who can't seem to grasp that their comments go straight into my spam folder and never see the light of day. You don't have to have your own blog in order to join in conversations. It may seem that everyone who comments knows one another but bloggers always welcome new commenters, after all that is how we all started. Sorry you got bitten! It seems the bugs are suddenly rather voracious nippers as I know several who have had nasty bites recently. Snakes have been a problem here, and several dogs have died apparently. Stay safe! I must be tasty, Deborah as I seem to attract biting things. I’ve never seen any snakes around here. I didn’t realise that adder venom was so lethal. If it hadn’t been for the biting wind, Kathy I think today would have been quite pleasant. That is too bad about the frost. We had a light freeze last night but thankfully fruits were not blooming yet here. 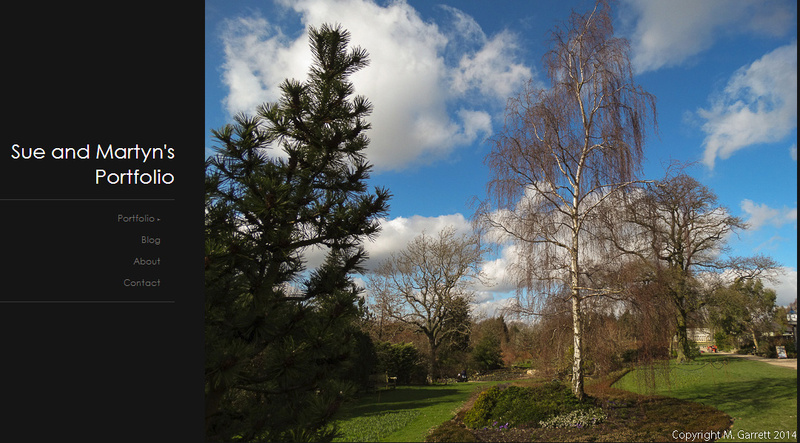 The spring weather can be so harsh and variable! You guys are so on top of it! I can't believe everything you pack into such a small area. You are truly an inspiration. It’s actually considered to be a fairly large area in our part of the world, Bonnie. We've had a bit of weather whiplash here too but not as bad as what you've experienced. It was sunny and almost hot yesterday and now it is cold and wet. My plans for dinner tonight got switched from salad to soup. I imagine most of your plants are going to recover from Mr. Frost's visit. Good luck! For us it’e Cold and dry, Michelle. The wind is drying things out too. What a good idea to plant garlic in a container. I find it takes up a section of my small garden for too long with sometimes disappointing results. If we don't have a rainy winter it seems I can't keep enough water on it. In a pot at least I'd not be losing garden productive space if the garlic doesn't produce well. Oh that PSB! It really does pay to be patient when sowing/transplanting into the garden in early spring, especially with the unpredictable weather we all seem to be experiencing nowadays. I'm hoping the weather that is set to come at the weekend stays so I can enjoy some warmer days on the allotment...the good thing about the cold though is it has made the digging more bearable...it's been quite nice to do something to warm me up!! The bees will visit the flowers for the nectar along with the pollen but they will sense if there is nothing around so if you have had repeat visitors to them then chances are your harvest will still be a good one...fingers crossed. It has been pretty cool here until the past few days. I think our last frost date is April 15 and it frosted fairly heavily that night. Now we are quite warm. Spring is really ramping up. I put out the tropical plants I wanted on the patio this year. We are to have a couple of days of fairly cool nights I am hoping the tropical will just think they are going through winter. We will see.